Enjoy up to 50% Off on a beautiful range of personalised new born gifts and accessories, whether you’re looking for a classic teddy bear, a warm knitted blanket or their first pair of high top trainers. 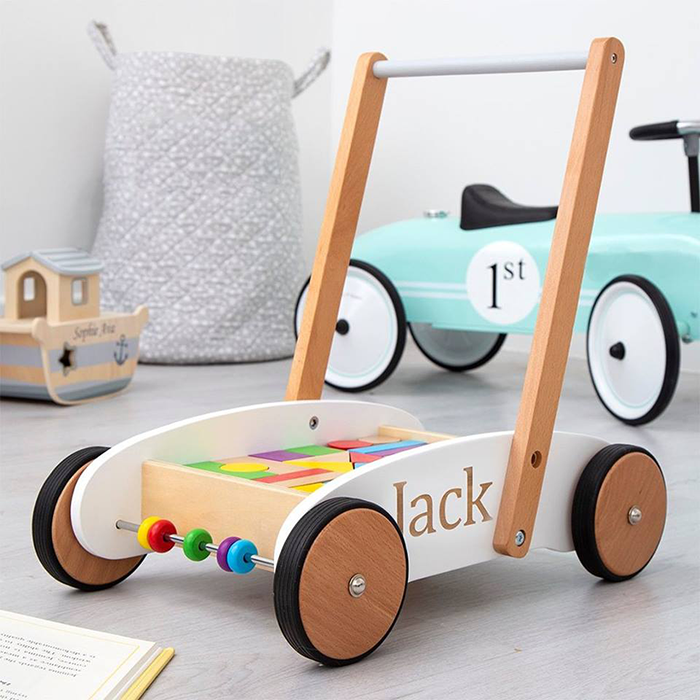 Little ones will love this beautifully crafted wooden walker toy complete with multiple colourful wooden blocks. This sensory toy would make a wonderful gift for a little boy or girl, and it can be personalised free of charge with a name of up to 9 characters for an added special touch. A very cute character light in an angelic white to keep your little angels content while they sleep. This would make the perfect addition to a child’s room or nursery and can be personalised for free with a name of your choosing for an extra special touch. Featuring little fabric unicorn ears and a soft unicorn horn, this super fluffy character onesie will soon become a firm bedtime favourite. Make it extra special by adding personalisation of a name or initials of your choosing. Little ones will look adorable in this personalised penguin robe, made from the softest, snuggliest fleece to keep them warm and cosy at the South Pole. Meet the online destination for personalised children’s gifts, toys, furniture and accessories where all products come with a luxury gift box and a lot of love. My 1st Years has been dedicated to creating high-quality personalised gifts, all made with as much love, as that very first pair of shoes. With next day delivery available and the brand’s iconic luxury gift box free with orders, it really is the online destination for gifts loved by all.